Samsung Galaxy S10 RAM Variants Leaked - Playfuldroid! Samsung is expected to announce the Galaxy S10 flagship phone in March 2019. A leaked document that has surfaced from China has revealed the different RAM variants of the Galaxy S10 smartphone. The below image reveals that the Galaxy S10 will be arriving in models like Galaxy S10, Galaxy S10 Plus, Galaxy S10 X and Galaxy S10 X 5G. The leak further reveals that the Galaxy S10 has 4 GB of RAM. Its Plus variant includes 6 GB of RAM. The S10 X is equipped with 8 GB of RAM. The Galaxy S10 X 5G could be one of the first smartphones to carry support for 5G connectivity. The handset is slated to debut in the same quarter in the coming year. It could be the world’s first smartphone to arrive with 12 GB of RAM. As of this writing, there I sno information available on the other specs of the Galaxy S10. The above document also states that the Huawei P30 and P30 Pro smartphones will be also launching in March 2019. It has further revealed that the Huawei P30 will be equipped with 8 GB of RAM. 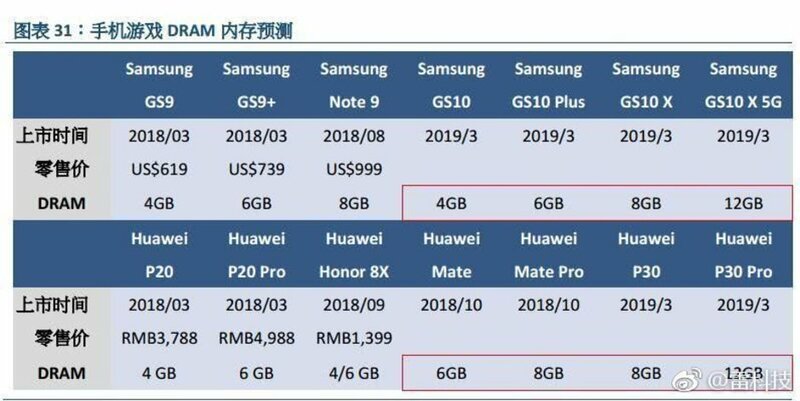 Like the Galaxy S10 X 5G, the Huawei P30 Pro will also include 12 GB of RAM. There is no confirmation on whether the Huawei P30 series will be equipped with 5G connectivity support.